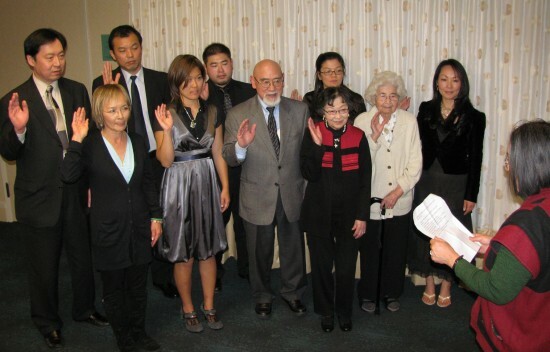 Yo Hironaka (third from right) being sworn in with other board members of the San Francisco JACL. SAN FRANCISCO — Yo Hironaka, a fixture in San Francisco’s Japanese American community, passed away on Aug. 30. She was known for her long-time involvement with the San Francisco JACL, Japantown Task Force, Christ United Presbyterian Church, and the Japanese Cultural and Community Center of Northern California. She served on the board of the JCCCNC for more than 25 years and was its last Nisei member. Although she shunned the spotlight, Hironaka, who was interned at Topaz, Utah, agreed to participate in the diploma ceremony, knowing that her presence would symbolize what happened to other Japanese American students who were forcibly removed from their homes during World War II and recognizing the importance of educating a new generation of students. Hironaka also received the 2011 Kay Okamoto Volunteer Award for volunteerism in such capacities as a Sunday school teacher at Christ United Presbyterian Church and a 20-year board member of San Francisco JACL. She organized two of the chapter’s annual events, Kenko no Hi, a community health fair, and the Spaghetti Crab Feed, whose proceeds are donated to a worthy local cause. Other honors she received include the Woman Warrior award from Pacific Asian American Women Bay Area Coalition (PAAWBAC) in 2000. “She knew that her cancer had returned and was given a very short time to live. She moved into The Avenue to receive hospice care from the beginning and didn’t want anyone to know. She didn’t want anyone to fuss over her or go out of their way. That was Yo, a very private person, not wanting to burden anyone. Comments posted on Facebook reflected the same sentiments. “It’s difficult to imagine Japantown without Yo. It really seemed like she would be around forever,” said JCCCNC board member Kyle Tatsumoto. “Thank you for all you’ve done for our community. You will be missed, and never forgotten,” said Chris Hirano, former JCCCNC director of community development. Hironaka was preceded in death by her husband, David “Taxy” Hironaka; daughter, Marcia Hironaka; parents, Konosuke and Rui Kiwata; and brother, Kenichi Kiwata. A celebration of Hironaka’s life will take place at the JCCCNC at a date to be determined. She will also be remembered at the center’s annual fundraising event on Sept. 29. For details, visit www.jcccnc.org.